Thirty years ago, Jack Nicklaus won the last of his record-setting 18 professional major championship titles at the 1986 Masters. A storied career was punctuated by a riveting and memorable final round that’s been called one of the legendary performances in sport. The 46-year-old Nicklaus fashioned a magical six-under-par 30 on the back nine to shoot 65 on his way to earning a record sixth Green Jacket. To this day, Nicklaus remains the oldest winner of the Masters and he also owns or is tied for some 35 Masters records. World-renowned golf artist Walt Spitzmiller captures on canvas Nicklaus’ dramatic birdie putt on the 16th hole in his extraordinary collection of 18 paintings simply entitled Jack’s Majors. 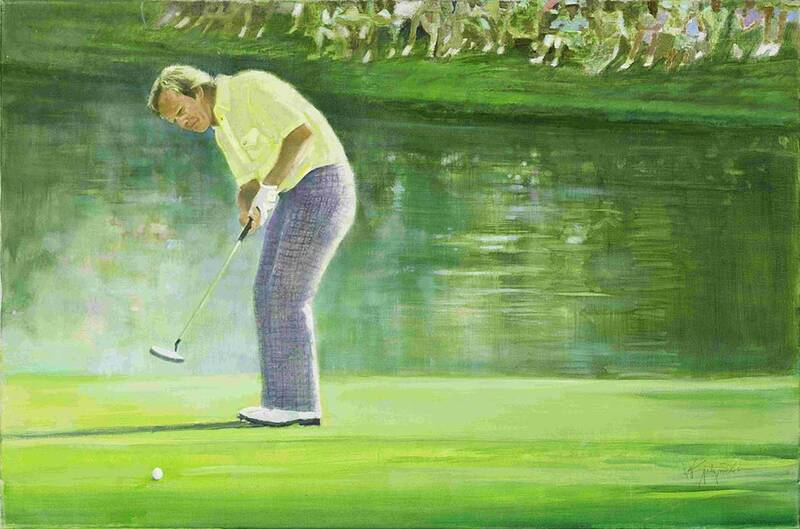 Each painting in the landmark series brings to life a special moment from the Golden Bear’s unmatched legacy. Spitzmiller spent eight years painting what he believes is golf’s greatest achievement of the modern era: Jack Nicklaus’ 18 major championship titles. Collectors and fans of Nicklaus can purchase Jack’s Majors in an exquisite and limited edition Portfolio book. Only 100 museum-quality volumes, numbered and signed by Jack Nicklaus and the artist, are available on a custom-order basis. The oversize hand-bound and luxuriously crafted Portfolio includes 18 giclée art prints (18” x 24”), along with accompanying text that recounts the highlights of each tournament victory. For more information, visit www.waltspitzmiller.com. Walt Spitzmiller is one of the world’s foremost sporting artists who specializes in golf. His work is widely held by private and corporate collectors, including many golf legends such as Jack Nicklaus, Arnold Palmer, Tom Watson and Lee Trevino, as well as the PGA TOUR. His iconic golf art captures the spirit of the game, its famous players and early legends, its fields of play and historic moments.